Since I was younger I always preferred frozen yogurt ice cream flavours compared to creamy and chocolate ones. For me ice cream is to refresh you and not to bloat you! The craze that has appeared lately with all the frozen yogurt stores has worked to my favour as at last I get a greater choice about my old time favourite summer treat. Few years back when I was looking for frozen yogurt recipes I would end up disappointed by the lack of choice. At last now I can find articles that give alternatives of the basic recipe on which I can add any flavours I like depending on my mood and my stock. Two of my favourite ingredients are coconuts and mangos. 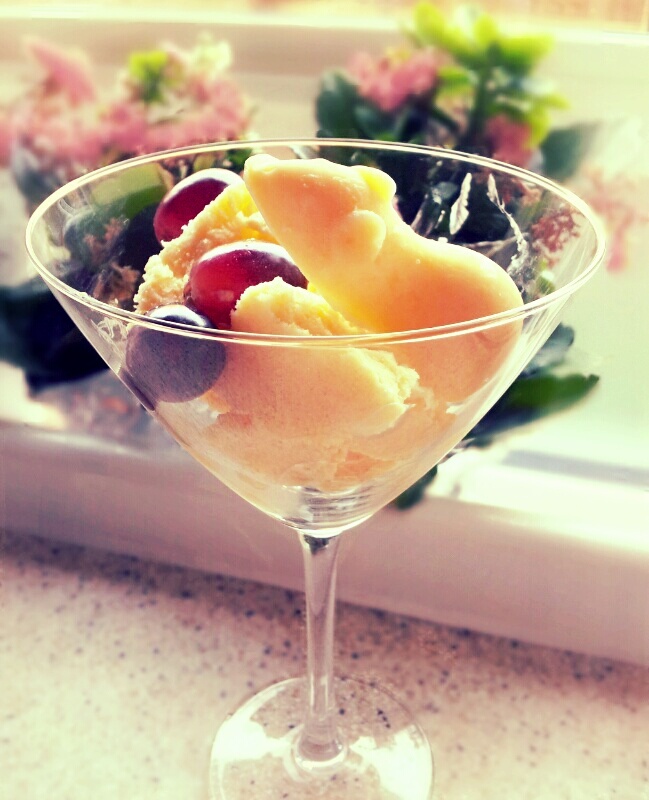 Frozen yogurt with mango is a flavour that can be widely found in stores. What I sometimes did was order/buy the mango flavour and sprinkle coconut flakes. Since it was winter I didn’t consume frozen yogurt or ice creams in big quantities thus I never thought of making. Now that the sun is out, spring is here and days are getting warmer I get craves for an ice treat almost daily. Not being a fan of processed food I decided to start making my own frozen yogurt. I decided to start with two of my favourite ingredients mango and coconut. I looked for recipes but none was good enough for my liking. Thus as always I used a basic recipe to make my own version. The recipes usually include sugar. Not being a fan of very sweet treats, don’t get me wrong I love baking but to be honest I enjoy more the baking process than consuming the baked goods thus I prefer to give them to other people, and wanting to keep the flavour as crisp and natural as possible I used very little sugar and added lemon to give it an extra crispness. I would suggest while you make the mixture try it and accordingly adjust the sugar and add any flavours you like! First we peel and dice the mangos. If we want the frozen yogurt to have small bites of fruit we keep half of one mango and cut it into really small cubes. The rest, 1 and a half, we place in a blender until they turn into a smooth cream. We add the yogurt, coconut milk and the juice of the lemon and we keep processing the mixture. We then slowly start to add the sugar one tbsp after the other trying in between until it reaches the level of sweetness we like. We pour the mixture into a bowl and then add the coconut flakes and mango small cubes if we had decided we wanted fruit small bites. Whisk the mixture with a spoon and we place the bowl in the freezer for an hour. After the hour we remove it from the freezer and with a spoon we whisk the mixture until it becomes smooth. Place it in the freezer again and leave it for 1 hour and 30 minutes. Remove from the freezer and repeat the whisking process. We leave it in the freezer for another 1 hour and 30 minutes and we again remove it. We whisk it again. What I did at this stage is use plastic baking mice moulds for some of the mixture to create serving decorations. We can also place the mixture in ice lolly moulds. Last stage? Place it in the freezer again until it is completely frozen. We can serve with fruits of our liking, fresh mint leaves or coconut flakes. We can also experiment with different fruit. What we have to remember is that every fruit has a different water consistency. Thus depending on how creamy we want our frozen yogurt to be we have to adjust the yogurt, milk and fruit quantities.